This week’s featured post is “The Trump Administration: What I’m watching for“. Last week there was no weekly summary and I hadn’t expected to post at all, but “How did my hometown become Trumpland?” just leaped out. In the meantime, I was giving a talk at the Unitarian Church of Quincy, Illinois about the longer-term problem in our democracy that the Trump campaign is just a symptom of. Nothing we’ve seen so far is reassuring. During the campaign I often heard Trump supporters claim that his inexperience in government and his lack of depth on the issues didn’t really matter, because he would surround himself with the best people. So far, there’s no indication that’s happening. Reince Priebus as chief of staff is, I suppose, the least worrying of the announcements. (If you want a mental picture of what a chief of staff does, that was Leo’s job in The West Wing.) He is a standard Republican who might have gotten a lesser position in a Romney administration. But Steve Bannon in the newly-invented position of chief strategist is deeply troubling. He turned Breitbart into the go-to news source for white nationalists. You can argue about whether he himself is a white nationalist or an anti-Semite — some people who know him personally say no — but he panders to those who are, so I’m not sure that what’s in his heart matters. Someone like Bannon would have been beyond the pale in any previous Republican administration. This is what worries me: If top American officials go around talking about a world war with Islam, they can make that prediction come true. I’ve often said on this blog that the crucial battlefield in the war on terror lies inside the minds of 15-year-old Muslims. Do they see a future for themselves in the current world order, or not? If they live in the United States, do they see Muslim-American as a viable identity, or not? Trump’s election tilts that decision in a bad direction; Flynn as his top security adviser tilts it further. So does the selection of Mike Pompeo to head the CIA. Pompeo is an advocate of torture and of expanding the prison at Guantanamo. In Congress, he was one of the most partisan members of the Benghazi Committee. When it comes to surveillance powers, he’s more catholic than the Pope. He wants to grant more authorities with fewer limitations than even the law enforcement or intelligence communities are asking for. But beyond the problems with any particular choice, the pattern is disturbing: So far, Trump is valuing loyalty over expertise. Bannon was his campaign CEO. Priebus brought the RNC to heel after Trump’s nomination. Sessions was the first senator to endorse Trump. Flynn was a campaign adviser. Trump-critic Eliot Cohen initially urged his fellow conservatives to put aside their differences and go work for the new administration, but then changed his mind after hearing reports from inside the transition process. “It was accusations that ‘you guys are trying to insinuate yourselves into the administration…all of YOU LOST.’…it became clear to me that they view jobs as lollipops, things you give out to good boys and girls,” said Cohen, who would not identify his friend. Compare this to the team-of-rivals Obama assembled. His chief Democratic rival became secretary of state, he kept on a Republican defense secretary, and he also nominated Republicans to head the departments of transportation and commerce. Trump critics like Ted Cruz and Mitt Romney have been called to Trump Tower and had their names floated for posts, but I’ll believe that when I see it. I think their attendance signifies nothing more than their submission. They won’t be appointed to anything without some serious public grovelling first. You know, we have a guest in the audience this evening. Vice President-elect Pence, I see you walking out but I hope you hear just a few more moments. There’s nothing to boo, ladies and gentlemen. There’s nothing to boo. We’re all here sharing a story of love. We have a message for you, sir, we hope that you will hear us out. And I encourage everybody to pull out your phones and tweet and post because this message needs to be spread far and wide. Vice President-elect Pence, we welcome you and we truly thank you for joining us here at Hamilton: An American Musical. We really do. Thank you truly for seeing this show, this wonderful American story told by a diverse group of men, women of different colors, creeds, and orientations. As you can see, the statement was respectful and not an attack of any kind. I would summarize it as a request for reassurance. It would have been easy for Trump to either ignore this or respond to it gracefully, with something like: “Of course we’ll protect all Americans and defend American values.” If he wanted to score some political points, he could have blamed the hostile media for inspiring such baseless fears of his administration. He didn’t do that. Instead, he launched a series of tweets Saturday and Sunday, calling Hamilton “overrated” and demanding that the cast “apologize” for their “terrible behavior”. Here’s how I read the incident: Trump wants people to be afraid of him. Why else do you slap down people who come to you asking for reassurance? The first thing I should acknowledge is that my returns-watching guide didn’t foresee the Trump victories in Pennsylvania, Wisconsin, and Michigan. I hope it was useful anyway, in the sense that as reality diverged from my predictions, you saw how the night was going. Some of my early warning signs of a bad night — the Indiana senate race getting called for the Republicans right away, Virginia taking a long time to come in — were indeed early warnings. I’m seeing a lot of finger-pointing among Democrats: Democrats who didn’t vote for Clinton are to blame; the Party is to blame for nominating Clinton in the first place; Clinton should have known the upper Midwest was vulnerable; Bernie should never have validated those bogus Republican trustworthiness issues by raising them in the primaries; black turnout should have been higher; and so on. The Founders and their bleeping Electoral College. Anybody who goes on a rant about what a bad candidate Clinton was and how unpopular she is needs to be reminded of the fact that she got something like 1.7 million more votes than Trump did. The Electoral College never worked according to the hare-brained scheme the Founders had in mind, and it should have been junked in 1801 after the Aaron Burr fiasco. The net effect of the College in recent elections has been to disenfranchise Californians. Clinton lost because her million-vote plurality included a more-than-two-million-vote margin in California. Similarly in 2000, Al Gore had the misfortune of locating 1.3 million of his 500,000-vote plurality in California and 1.7 million in New York. Unfortunately, since Republicans owe two of their last three victories to the College, it has become a partisan advantage, so we’ll never get rid of it now. The Russians. Without the constant drip-drip of pseudo-scandalous headlines from Democratic emails hacked by the Russians and published by WikiLeaks, the Clinton campaign could have done a much better job of controlling its message in the final month of the campaign. The biggest scandal of the 2016 campaign is that the winning candidate owes his victory to the meddling of a foreign power, and that Republicans seem not at all bothered by this. The FBI. James Comey violated the Justice Department rules about not interfering in elections, derailing the momentum that Clinton seemed to have going into the home stretch of the campaign. Similarly, lower-level sources inside the FBI kept on feeding the right-wing media leaks about ongoing investigations of the Clinton Foundation, which I suspect we will never hear about again now that these “investigations” have served their partisan purposes. The media. The fact that low-information voters — and a lot of people who pay more attention — got the idea that Clinton and Trump were equally flawed candidates is due to a gross distortion of election coverage. Voter suppression. Vox makes a good case that Republican moves to suppress minority turnout didn’t make the difference by itself. But it was definitely a factor in Wisconsin and possibly elsewhere. I continue to believe that Clinton would have been a good president, but Trump won and the Republic is in real danger now. There’s a legitimate argument to be had within the Democratic Party about whether to put forward a sweeping agenda for radical change, or to stand for the reasonable center against the radical Trump administration. But both messages will be out there in the next few months, and they will either gain traction with the public or they won’t. Arguing over how 2016 was lost isn’t a worthwhile use of our energy. Huyên Phương Lê I am considering many grad schools in the US for my master course next fall. Before the election, I only looked at the ranking, the alumni’s feedback, the requirements and the fee and campus life. Now, I really have to think about the safety. As an Asian woman, I don’t expect anyone to stop me in the street and tell me to get back to China (which I am not from). So now, although I was so sure about some schools in Texas and Wisconsin, I have to sit down once again, and closely look at the cities, and hope that they are not too red. This election changed my mind about America. Does this surprise anyone? Now that the election is over, Donald I-never-settle Trump is paying $25 million to settle the Trump University lawsuits. Part of the agreement is that he admits no wrong-doing, but who pays $25 million to people they haven’t wronged? Especially if it’s a “phony lawsuit” and an “easy win”, as he claimed earlier this year. Donald Trump committed fraud against thousands of ordinary Americans. That isn’t some partisan fantasy, like the charges against the Clinton Foundation. It’s a fact. An amusing bit of satire: Andrea Grimes isn’t ready yet to deal with all the Trump supporters who want to talk to her so that they can understand why their candidate lost the popular vote. Interesting story in the NYT about the widespread falsehood that the protests against Trump were fake, with paid protestors bused in. A guy with 40 Twitter followers saw some buses in Austin at about the same time protests were happening, jumped to a conclusion, and tweeted a picture. That fake “news” filled a psychological need, so it got shared hundreds of thousands of times before anyone checked it out. The one encouraging thing in Trump’s proposals was supposed to be his infrastructure plan. Obama has been proposing infrastructure programs for years, hoping to create jobs by doing stuff that needs to get done anyway, but Republicans in Congress have blocked him. Trump’s plan is not really an infrastructure plan. It’s a tax-cut plan for utility-industry and construction-sector investors, and a massive corporate welfare plan for contractors. … Trump’s plan isn’t really a jobs plan, either. Because the plan subsidizes investors, not projects; because it funds tax breaks, not bridges; because there’s no requirement that the projects be otherwise unfunded, there is simply no guarantee that the plan will produce any net new hiring. Investors may simply shift capital from unsubsidized projects to subsidized ones and pocket the tax breaks on projects they would have funded anyway. Contractors have no obligation to hire new workers, or expand workers’ hours, to collect their $85 billion. For example, imagine a private consortium building a toll road for $1 billion. Under the Trump plan, the consortium might borrow $800 billion while putting up $200 million in equity — but it would get a tax credit of 82 percent of that sum, so that its actual outlays would only be $36 million. And any future revenue from tolls would go to the people who put up that $36 million. … why do it this way? Why not just have the government do the spending, the way it did when, for example, we built the Interstate Highway System? It’s not as if the feds are having trouble borrowing. And while involving private investors may create less upfront government debt than a more straightforward scheme, the eventual burden on taxpayers will be every bit as high if not higher. What was talked about during the campaign may not be exactly what gets proposed. But whatever gets proposed needs to be closely examined. 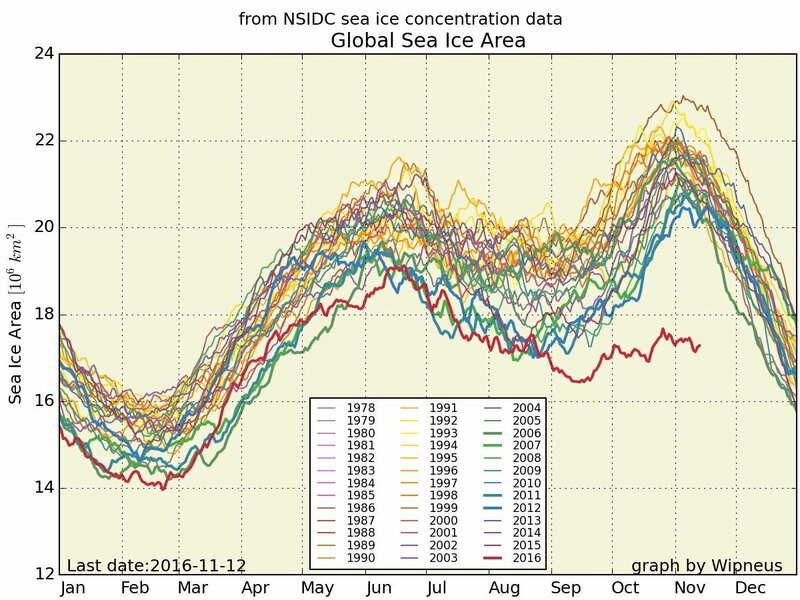 Here’s a graph of the area covered by sea ice, world-wide, with the (red) 2016 falling well below previous years. There’s some debate about what it means, because it lumps together Arctic and Antarctic ice, which are two very different situations. But it can’t be good. One of the weird consequences of the election for me personally (after a couple days of depression) was the energizing thought: There is so much that needs to be written now. For example, up until now I’ve taken it for granted that certain kinds of white racism didn’t really need to be addressed, because they were already taboo for serious conversation. That’s not true any more, so sometime soon I’ll be writing about the difference between my own sense of pride in where I come from and “white pride”, as well as addressing the question of why there’s no White History Month. As I say, that didn’t used to be necessary, but it is now. We used to be able to just scoff at this stuff, but now we need an articulate response. In general, there’s a lot about race that is well understood academically, but hasn’t been sufficiently popularized. Posts on that theme will come out fairly often, I expect. An ongoing theme of the coming months is likely to be the typical progress of authoritarian/fascist governments, and whether or not we’re seeing that in the Trump administration. One important article in this regard is Jason Stanley’s “Beyond Lying: Trump’s authoritarian reality“. Donald Trump is trying to define a simple reality as a means to express his power. The goal is to define a reality that justifies his value system, thereby changing the value systems of his audience. I think I’m going to listen to this a lot in the next four years: “Your Racist Friend” by They Might Be Giants. We might all be having conversations like this soon. “I hope it was useful anyway, in the sense that as reality diverged from my predictions, you saw how the night was going.” It did. I can’t say it was heartening, but it helped me prepare for the end of the night earlier than most people. Thanks for your writing – I almost never comment but I look forward to your pieces every week, and often share them on facebook. If we are indeed at the end of Book Two, as you said in another piece this morning, I am glad we have people like you helping to write our way into Book Three. I would love to see you write a piece on news sources. As I try to open conversations with Republican friends about various issues, they keep devolving into “Well, I don’t trust that news source.” How can we hope to have honest, open conversation if we can’t even agree on the information we’re talking about? A friend of mine posted on FB about the “Craigslist Ad” that was supposedly paying people to protest against Trump. When I posted a Snopes article debunking the story, she shot back with “Well, I don’t trust Snopes.” I’m trying to combat the misinformation that’s circulating out there, but if we can’t even agree on news sources, how are we supposed to communicate with each other? This has been my problem as well. How can we find facts that we all agree on? This problem was at the heart of the talk I gave in Illinois during my “week off”. If this attitude wins the day among democrats then our troubles are just beginning. As Joe Biden once told the dearly departed Gwen Ifill, past is prologue. If we don’t learn from our crushing defeats we will be doomed to repeat them. The courage to be self-critical is key here, and the candidates you offer here as to why the democrats got defeated, Doug, the electoral college, Russia, the FBI, sorely lack this piece. Rational, clear-headed self-critique is hard work, maybe the hardest. Sure, let’s not run in circles playing the blame game, but let’s not stick our head in the sand either. There are lessons to be learned here, and if you’re wondering where to start you can do a lot worse than Glenn Greenwald’s piece on the subject: (https://theintercept.com/2016/11/09/democrats-trump-and-the-ongoing-dangerous-refusal-to-learn-the-lesson-of-brexit/). If we put up another Hillary Clinton, another John Kerry, in four years, Trump winning a second term is all the more likely. A recurring theme from the Clinton campaign come to mind. Remember the “half-loaf” trope where Clinton apologists, including some here, seemed to mistake the ends for the means? We were solemnly told that progress is incremental and we have to be willing to compromise every step of the way as much as possible to earn that progress, and who better to embody compromising democratic ideals than the Clintons? Crazy leftists like Sanders asking for a whole loaf just don’t know how politics work. Well, maybe that used to be true, but 2016 broke that if it wasn’t already. Progressive voices like Robert Reich, who argued that you need to come to the table asking for a big enough piece of bread to make the half-loaf meaningful, were completely justified by this election on this point and many others, but perhaps their warning here didn’t go far enough. Yes, fight for a whole loaf, but beware the flip-side – ask for too little bread, and you’ll be dismissed without so much as a crumb. Pretty much everybody’s critique right after a lost election is “You all should have listened to me from the beginning.” I think it’s very hard to argue that Greenwald’s pet issue — the national security surveillance state — played to Trump’s advantage. Go ask some Trump voters what they think of Edward Snowden or Chelsea Manning. Neither “Crazy Bernie” nor “Crooked Hillary” will run in 2020, so I don’t see the point in re-arguing the primaries. Bernie had his own flaws as a candidate, and the free ride he had gotten from Republicans would have ended as soon as Hillary was out of the way. If you are looking at different moral universes, I highly recommend the work of Jonathan Haidt, a social psychologist who has done some really interesting work in the area that would appeal to you and help us all understand the universe of a large part of the world. He has talks on YouTube but his book, The Righteous Mind, is more comprehensive. I discussed his book in this post. This challenges my belief, and yours, that Hillary would have been a good President, or even good enough. It’s a theological variation of the revolutionary argument that things must get worse before they can get better. Charles Eisenstein states it in terms of spiritual transformation flowing into all realms. Walter Wink wrote in this vein also. It’s not doing anything for me. During the Cold War, I remember hawks arguing that war with communism was inevitable anyway, so we should just do an all-out nuclear strike and get it started on our terms. Instead, we muddled along and got through that period of history without a nuclear war. Muddling along is a much underrated strategy. I think people who hope for revolutions haven’t studied actual revolutions well enough. They’re nasty, and they usually don’t wind up anywhere near the goal their instigators intend. it appears that the readers of Breitbart are disdainful of the KKK and mostly seem to be annoyed that the mainstream media is painting Breitbart readers as KKK supporters. Do most white nationalists disdain the KKK? Or have they suddenly decided en masse since the election to disavow the KKK to hide the fact that white nationalists congregate at Breitbart? Two things are going on here: First, the KKK has a bad image, so many people who share a lot of KKK beliefs will deny the resemblance. (After all, they don’t want to kill black people, they just think blacks who are unhappy here should go back to Africa where they belong.) But also, white nationalists aren’t the whole Breitbart audience, they just feel accepted there. To get a different notion of the Breitbart audience, look at the comments on an article like this one, where Pat Buchanan is making the case that white people need Trump the way black people needed Obama. Buchanan would be horrified if you said he was a KKK sympathizer, but he draws out a lot of white nationalist comments, like “Brown people can’t assimilate.” and “The problem is non-white immigration.” These people aren’t trolling; they’re stating an opinion they expect others to agree with. Thanks, Doug. That does look even worse than Fox. In fact, searching on one of the phrases from the comments in the breitbart article you linked, google shows 35 hits at breitbart.com for the phrase “Africa for the africans” (probably all in the comments), and only 3 hits for that phrase at foxnews.com (in comments).